Home » Plasma Research » Local transport and radial electric field studies in ECH plasmas of the TJ-II Stellarator. Local transport and radial electric field studies in ECH plasmas of the TJ-II Stellarator. 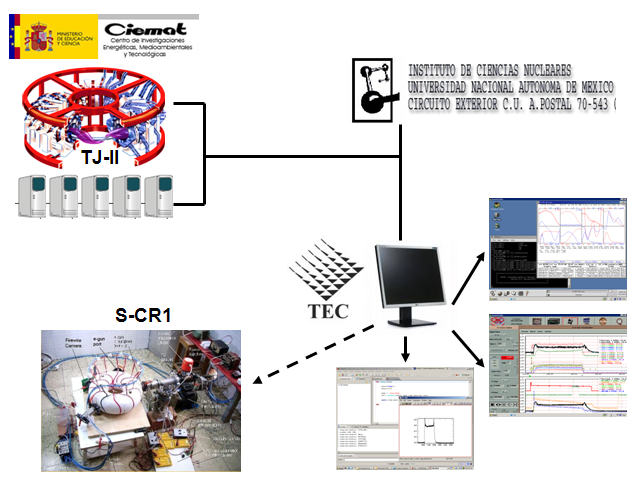 The project aims to characterize and interpret the experimental microwave heated (ECH) plasmas produced in the TJ-II Stellarator. To achieve this, an interpretative transport analysis will be performed using density and heating power scans (similar to Refs ,  and ) ¨to systematically study the radial electric field according to, at least, two analytical models. This will be done in cooperation to the Nuclear Science Institute (UNAM). In addition, data from a new ECH power fine- scan performed during the spring of 2008 in the TJ-II will also be analyzed, and a review of electron thermal energy transport will be performed once the absorption of ECH power by the plasma is known, so that TJ-II data may be added to the international database of energy confinement times. Finally, theoretical and semi-empirical transport models will be tested and compared with the dynamic evolution of TJ-II ECH plasmas to improve the models of Ref. , and to apply them to the new cases of transition to lithium walls. V.I. Vargas, D. López-Bruna, J. Herranz, F. Castejón and the TJ-II Team. Experimental electron heat diffusion in ECH plasmas of the TJ-II stellarator, Nucl. Fusion, 47, 1367, 2007. V.I. Vargas, D. López-Bruna, J. Guasp, J. Herranz, T. Estrada, F. Medina, M.A. Ochando, F. Castejón, J.L. Velasco, J.M. Reynolds, A. Salas and the TJ-II Team. Density dependence of particle transport in ECH plasmas of the TJ-II stellarator, Informe Técnico CIEMAT, n° 1162, febrero 2009. V.I. Vargas, D. López -Bruna, J. García, A. Fernández, A. Cappa, J. Herranz, F. Castejón. ECH power dependence of electron heat diffusion in ECH plasmas of the TJ-II stellarator, 35th EPS Conference on Plasma Physics, Crete, Greece, 9-13 June, European Physical Society, P5.018 (2008). I. García-Cortés, D. López-Bruna, F.L. Tabarés, T. Estrada, F. Medina and the TJ-II Team. Spontaneous improvement of TJ-II plasmas confinement, Plasma Phys. Control. Fusion, 44, 1639, 2002.